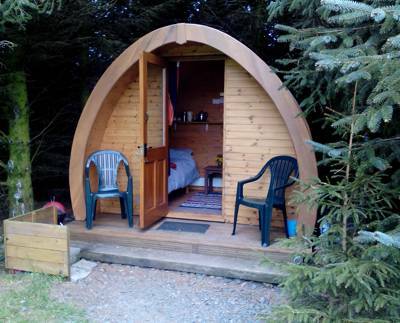 All weather camping pod sleeps 2 adults & 1 child, or one adult and 2 children. 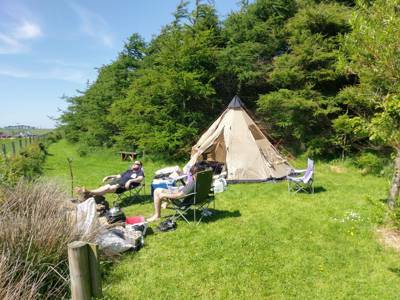 Back-to-basics camping near Scotland’s wildly beautiful south-west coast – North Rhinns Camping is a small quiet camping field in a stunning rural location. Tent pitches are well spaced and private, according to the lie of the land and leaving bushes and trees to divide them. Small campervans accepted, under (6.3 metre), plus we have a fully insulated camping pod. Modern facilities building has hot water for shower, wash basins and washing up sinks included in price. Campfires at most pitches. Drinking water at all taps. No need for bottled water. We keep a strict limit on the number of people who are on the site at any one time, so at busy times we may make some pitches unavailable to make sure we are not overcrowded. Very young children (under 6 years) are restricted to certain pitches (for online bookings). Dogs and other pets are welcome, with considerate owners. Agressive dogs NOT welcome. We need to know the breed or type of your dog/dogs when you book, helps us to offer suitable pitches. If your dog attacks/bites anyone on the campsite you will be told to leave. When we are not fully booked we can be very flexible, so if our online offers do not meet your specific needs, please contact us directly by phone or by email or our website to discuss options. Our campsite is suited to campers who enjoy PEACE AND QUIET. Ideal for birdwatchers, cyclists, walkers, sea anglers. Bird life in abundance. FAMILIES WITH CHILDREN ARE ASKED TO RESPECT THE PEACE AND QUIET OF OTHER CAMPERS. Children should be supervised by their responsible adult at all times. WE DO NOT PROVIDE PLAY FACILITIES. Noise and nuisance. We as owners have the right to advise you to leave if you do not respect other campers, or ourselves, by making a continual noise or nuisance of yourselves. If you are making a booking to arrive the same day or the next day please phone or text us to let us know that you are coming, in case we have not seen our emails. 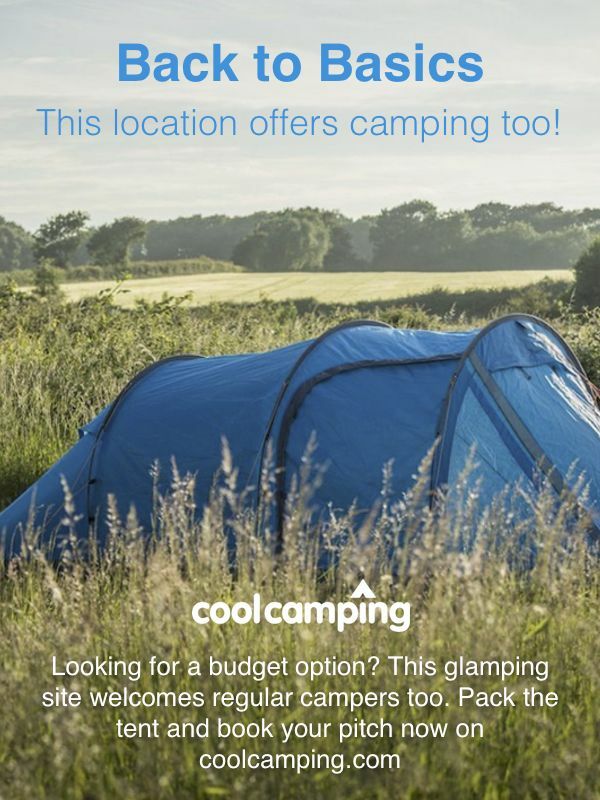 For latest availability and best prices for North Rhinns Camping, please use the Date Search above. Campfires allowed. 10-ish pitches and 4 hook-ups (pay-as-you-go card). Pitches have a secluded feel with 2 separate parking areas to provide vehicle free camping and preserve the grass. If you want total privacy please enquire for particular pitches. Full disabled access can be provided and the immaculate new washblock has a disabled loo. There are laundry facilities and a walk-in shower room big enough to hose down the muckiest of pups. Plug for a hairdryer. Dogs are welcome on leads. Picnic tables and fire pits provided (you can buy wood, kindling and matches). There is a well-stocked and licensed community shop 2 miles in Leswalt that gives cashback. The local sea fishing is fantastic – Rob will point you towards the best spots. There is a sandy beach 2 miles away and other secluded beaches can be reached by car, as well as some on foot. The holiday town of Portpatrick is 10 miles away. The Southern Upland Way (01835 824000) is 5 miles away and particulalry good walks can be found at the RSPB reserve at Mull of Galloway along with a Lighthouse there. There is also an interesting route to take in to discover all the gardens of Gallowaywith a nearby favourite being the grounds of Castle Kennedy, well worth a visit. The hotel in the lighthouse (01776 853220) at Corsewell Point, 9 miles from the site, does fine food and does yummy tea and scones, too. The Crown(01776 810261), The Harbour House (01776 810456), Mount Stewart Hotel (01776 810291) and Campbell's resturant (01776 810314) are amongst others at Portpatrick, with live music at The Crown on Fridays and Saturday nights. If you're looking for something a little more on the hoof then try the fish and chip van in Portpatrick harbour (Wednesday – Sunday in high season). Kirkcolm 9 miles away has the Blue Peter hotel (01776 853221), a superb real ale pub that serves food friday-sundays. From Stranraer head west following signs for Leswalt, Kirkcolm. After golf course on right go straight on at roundabout into Leswalt. Pass shop on left and continue straight up steep hill, after which site is 1 mile further on, first cottage on left. There are Tourist signs for North Rhinns camping 2 miles away at Leswalt Kirk crossroads in the village. Long Distance buses and coaches direct to Stranraer from Carlisle, Dumfries, Glasgow and Ayr. Bus 408 runs from Stranraer to Leswalt, 2 miles walk from site. There is also a railway station at Stranraer (6 miles) that has direct trains from Glasgow and Kilmarnock. 10 grass tent pitches, 3 that will take large 6 man tents with electric hookups. Max of 3 campervans (up to 6.3 metres in length) on hardstanding with grass area beside. 1 camping pod sleeping 2 (3 at a squeeze). It may not always be possible to have the exact pitch you see in the photograph when booking.